Tax policy is a hot item in the news these days. In his State of the Union address President Obama laid out several changes he’d like to make to the tax code. Republicans also have their own plans to revitalize the tax code. Regardless, there’s much optimism in the air around the possibility that tax reform could be an area of compromise this year. Acting upon these beliefs, Coolidge worked tirelessly to reduce the burden of taxation on the American people. The rate of tax coming out of the Great War topped out at 77 percent for income over $1 million, due to the necessity of funding the troops in Europe. During the Harding Administration the rates were reduced substantially with the Revenue Act of 1921. In 1922, the combined top marginal normal and surtax rate was reduced to 58 percent from 73 percent, and then to 50 percent in 1923 (income over $200,000). The Revenue Act of 1924 reduced rates retroactively for 1923, and by 1924 the top rate had come down to 46 percent of income over $500,000. After that initial round of tax cuts Coolidge continued to cut. His Revenue Act of 1926 lowered the top rate again, this time all the way down to 25 percent for incomes over $100,000. Because that act too was retroactive, the 25 percent rate was in place from 1925 to 1928, even lower than Ronald Reagan’s top tax rate of 28 percent. Many question the importance of Coolidge’s tax reductions to the economy. The Treasury Secretary who presided over the cuts, Andrew Mellon, provides a worthy answer to such questions in his book Taxation: the People’s Business. Mellon noted that many wealthy individuals had placed large amounts of money into tax-sheltering financial instruments such as municipal bonds instead of investing that money in the private economy, all in order to avoid paying the steep rates under Woodrow Wilson. This trend was reversed with the enactment of the Harding-Coolidge tax cuts. As a result of these policies the economy flourished. Economic productivity increased, as did employment and income levels along with it. Not only that, but the government collected more tax revenue in many years after the Coolidge tax cuts were enacted than before, as a result of a growing economy and so many high-income earners deciding to invest their money instead of sheltering it. In fact, not only did high-income earners pay a larger amount of taxes, but they also paid a higher percentage of all taxes. 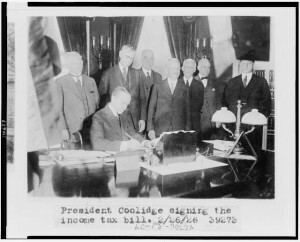 Perhaps most important, Coolidge used his tax accomplishments to help pay down the national debt. By the time Coolidge left office the national debt was lowered to $16.9 billion in 1929 from $22.3 billion in 1923, and the Federal Budget was reduced to $3.3 billion in 1929 from $5.1 billion in 1921. Coolidge’s fiscal policy was a pivotal ingredient for the prosperity of the Roaring ‘20s. Flappers and jazz certainly played their role in that jet set age, but if you want to know why the 1920s was a booming decade you must look to Coolidge’s sound management of the public purse. Coolidge understood that he had a special duty to soundly administer the Treasury by imposing prudence and moderation upon its activities, and the people rewarded him for it. Coolidge proves that thrift, saving, and investment are winning formulas for the success and prosperity of the economy. We should look back and celebrate the fact that the president we love so dearly managed the government’s financial affairs in a manner that was both sensible and beneficial to the American people.